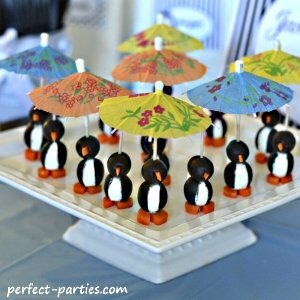 This was a perfect side dish for our Penguin Party! It was a big hit with the kids...add a toothpick parasol and you have the cutest dish! Tooth picks or for a little flair either Umbrella picks or with the frilly cellophane top. Drain olives in colander and place on paper towel. Select firm even shaped olives . Using small knife or kitchen shears, cut up the center of an olive. Use 1/8 teaspoon and scoop a rounded amount of cream cheese, carefully remove from the spoon and shape with fingers if needed. Gently spread the olive with the cut and insert cream cheese, gently squeeze the olive around the cream cheese. Slice the end of a baby carrot to make a flat surface. Cut a 1/8 inch slice. Cut a small triangle in the carrot, to form the beak. The remaining piece of carrot will create the feet. Take your second olive and insert the beak into the back end of the olive. If it gets pushed in too far, use the toothpick to push it back out. Take your toothpick and poke it through the center of the "head" of the olive penguin. Place the "body" on the carrot feet. Poke the toothpick through the body into the carrot feet to secure. Use rainbow toothpicks or the frilly toothpicks for variation. Keep cream cheese chilled until ready to use. Have a paper towel handy to wipe hands. Using your finger gently wipe off excess cream cheese.